Excellent tyre quality is a fundamental requirement for most motorists. Yet do you really know what kind of technology you’re relying on? Yokohama’s expert engineers are continually innovating to ensure that their tyres are market leaders. It’s one reason the company has had such longevity in a competitive market - in 2017 the Yokohama Rubber Company celebrated its 100th anniversary! The patented Orange Oil technology which Yokohama’s expert team developed a few years ago has been a huge step in tyre manufacturing. 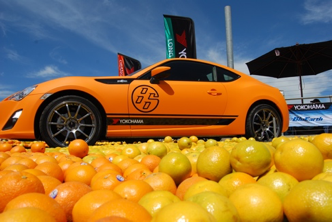 The engineers discovered that combining Orange Oil with natural rubber creates a tyre that’s 80% petro-chemical free. Most tyres use oil that comes from petroleum. While it’s not as eco-friendly as walking or riding a bike, it is a significant improvement on the alternative. It also helps give better grip in wet weather, plus excellent durability and fuel efficiency. The unique nano blend gives excellent grip in the wet and confidence when cornering. The Orange Oil technology also gives the BluEarth tyres better flexibility, which means the tyre has optimal contact with the road. This promotes durability and wear resistance. Decreased rolling resistance means better fuel economy and reduced CO2 emissions. Finally, the BluEarth tyres give a quiet, comfortable ride. Who wouldn’t want that in a tyre? The 5 pitch tread variation means low tyre and cabin noise. These combined factors make the BluEarth Es ES32 and the BluEarth-A-AE50great choices for the urban family who are looking for core technical performance combined with value and environmental responsibility. If you’re interested in finding out more, locate your local Yokohama dealer today!